If you’re looking to sell products online but don’t have any experience in web development, don’t worry. MagePlus is a complete eCommerce solution that allows you to set up an online store to sell your goods. What makes MagePlus great is that it is one of the cheapest fully hosted website solutions. In this post, we are discussing what is MagePlus and how it can help you to build your online business. MagePlus is a fully hosted Magento eCommerce platform. It means that you don’t need to have website hosting and eCommerce platform separately. MagePlus will do it for you. Just sign up for MagePlus and our developers will install and configure a Magento eCommerce store as you like it in just one day. Sign Up for MagePlus with just $1 for the first month. You can test the platform and see whether it is perfect for you requirements. Choose from thousands of Magento themes available online and have us install it. And you can also get help in customizing your store to match your brand needs. You can use 100s of Magento extensions to market your store. The SEO extensions available in the Magento Marketplace help you to rank your store in search results. Also, merchants can leverage email marketing platforms like MailChimp, Sendgrid etc.. to attract and maintain a loyal customer base. Pricing of MagePlus depends on what type of business you are running. Basic MagePlus plan will help new businesses to launch their eCommerce store with just $29.99 per month. Also, it provides unlimited staff accounts, product listings, offers, discounts, professional reports and gift certificates. Established eCommerce businesses can use MagePlus $79.99 per-month standard plan. The standard plan is coming up with Aspiration CDN. Businesses trying to scale their eCommerce store can utilize MagePlus $299.99 per-month advanced plan. The advanced plan has more resource limit to suit your business scaling. Also, the advanced blogging facility coming up with the standard and advanced MagePlus will help you to get better brand visibility and search engine rankings. 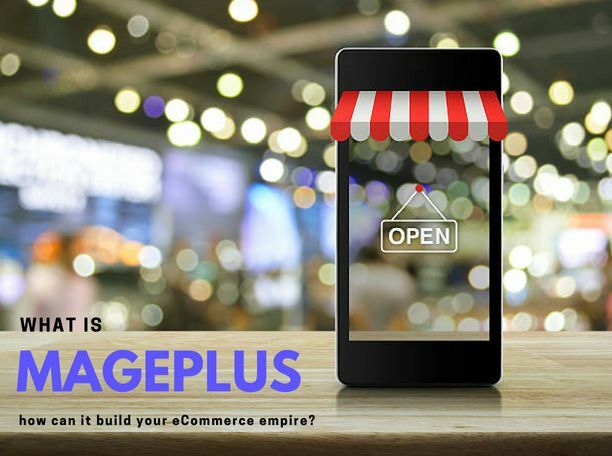 In short, running your eCommerce store in just one day becomes easier with MagePlus. Therefore, get your eCommerce store right now.